WHAT : A Kudzu Supper Club in support of building relationships between local farmers and chefs. WHO: A Taste Network Event featuring: David Sweeney of Dynamic Dish, Local Farms, and Persimmon Creek Vineyards. WHERE: A Secret location within 1 mile of the downtown Atlanta. WHY: The following event raises awareness of the local, organic and biodynamic farmer, supporting chef and winemaker. 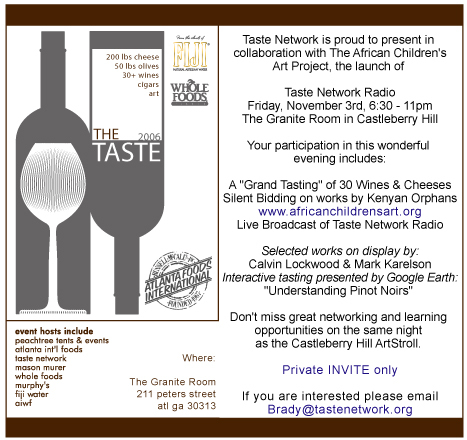 Atlanta, Ga – Taste Network will host a Kudzu Supper Club at a secret location on November 8, 2008 at 6:30 p.m . Taste Network, an Atlanta based company, has partnered with David Sweeney of Dynamic Dish for a one of a kind field to table experience available to the public. A five-course meal prepared using local produce and proteins from Atlanta's best urban gardens. Farmers attend and address the group during the dinner. David Sweeney of Dynamic Dish is leading the city with the best vegan and vegetarian menu with his network of local urban gardens. Wine pairings and cheese course by Brady Lowe of the Taste Network. The event will take place 1 mile from downtown Atlanta and the location will be announced 24 hours before dinner. The cost is $125 and RSVP is required. The experience will include a reception and five-course dinner paired with wines from Persimmon Creek Vineyards of Northeastern Georgia. Taste Network will pair varietals from around the world to these native Georgia vines for a side-by-side comparison. The dinner is the ninth in a series of ten experiences focused on telling the story of the local, organic and biodynamic farmer. The Kudzu Supper Club would like to thank everyone for supporting dinner number two. Kudzu Supper Club #1 What a great night! The Kudzu Supper Club would like to thank everyone for supporting the very special inaugural dinner. 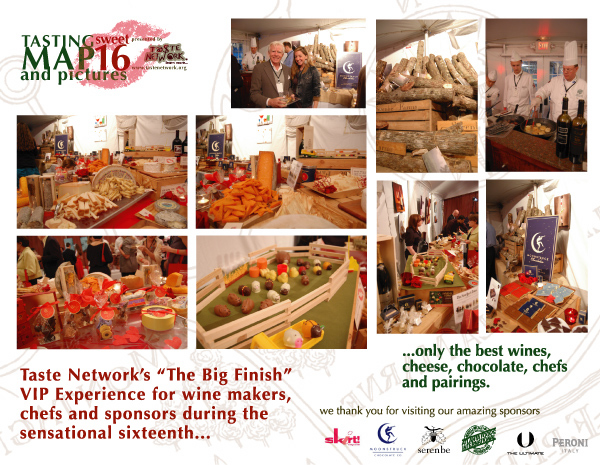 As promised, Taste Network would like to provide you with a list of all the wonderful partners listed below the pictures. If you are interested in the menu and stories of the farms, wines and cheeses, please click here to download the dinner packet from Kudzu Dinner #1. We would also like to provide a great dish by dish recap of the evening by fellow diner Cathy Ding at www.livetonibble.blogspot.com (a great blog and a wonderful website to explore). We would like to say thank the amazing chefs, Anne S Quatrano, Adam Biderman and Taylor Johnson of Star Provisions for all their hard work and dedication to increasing the footprint of sustainable food culture in the community and all the inspiration they provide. Your Hosts, please thank them by visiting their websites or businesses. Don't miss this opportunity to join us during this amazing dinner series. please feel free to contact Brady Lowe. Please sign our newsletter to be informed. A totally private event for charity. This are the details from last Taste. To UNSUBSCRIBE, please follow the instructions set forth by Constant Contact. Found at the end of the email. Thanks.